Talk about drama! 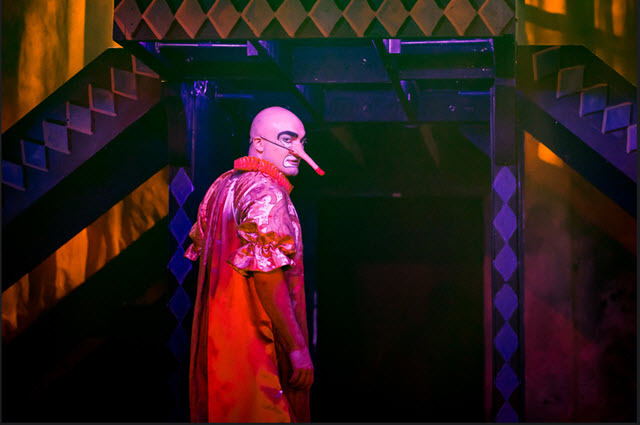 With a scant 24-hour notice Vato Tsikurishvili was thrust into the role of Cyrano when leading man Justin Bell fell ill. Vato, a consummate performer and teacher, has performed in countless Synetic productions – his parents, Paata and Irina Tsikurishvili, are co-founding Artistic Directors. He has performed with the troupe since he was four and is a nine-time Helen Hayes Award nominee and five-time award-winning ensemble member with Synetic. He is also the Director of this production of Cyrano de Bergerac and naturally knew all the scenes. And since this is one of Synetic’s famed series wordless productions., at least he didn’t have to learn lines! Crisis averted. During the six years I have reviewed Synetic’s stagings, they have performed within many unique sets. I once was blown away as they did the entire play in six inches of sand and another time for The Tempest the stage was constructed to hold six inches of water. Once they surrounded the stage with tall plexiglass panels so the audience wouldn’t get drenched in Day-Glo paint that was splashed around in a massive hookah-smoking party scene. But in this equally imaginative interpretation, one of their finest to date, there is no elaborate staging and no moving sets. 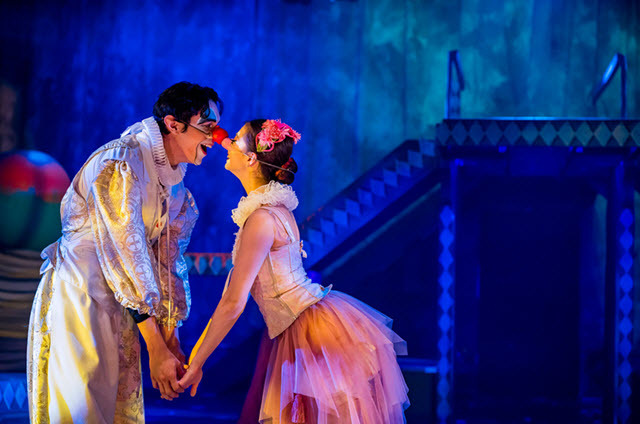 It is just pure theater – full of classical pantomime, eye-popping dance and clever acrobatics. We all know the story of Cyrano. Dismissed as a lover by his unappealing looks (the nose! ), he nevertheless remains friends with Roxanne. When his dashing friend Christian tells him of his love for the beautiful Roxanne, Cyrano takes a back seat, helping Christian write tender love letters while the men are off to war. As a result, she falls madly in love with Christian and marries him only to discover after his death, that Cyrano is the author of those letters that so touched her heart. Their re-uniting as old folks is what makes this an indelible and ageless love story. 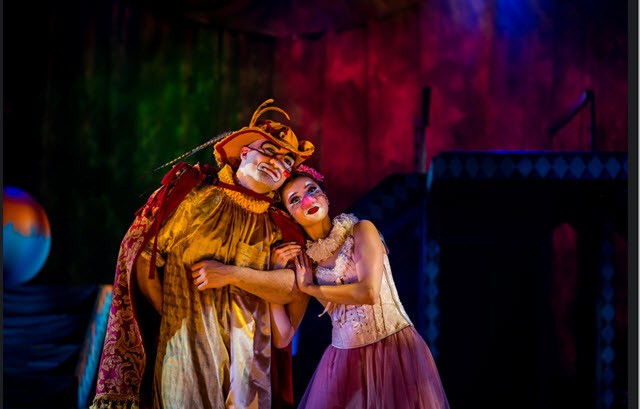 Vato uses the 19th century play by Edmond Rostand as backdrop for this magnificent action ballet and pantomime starring Maryam Najafzada, a young classically-trained Azerbaijan ballerina. 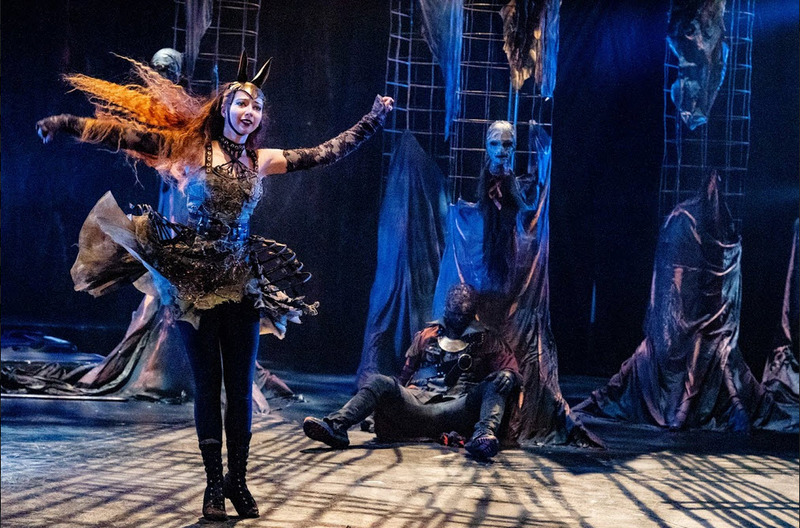 We saw and raved about her last October in Synetic’s production of Sleepy Hollow. Najafzada is as liquid as poured mercury. She first appears as a swan bathed in a golden light. Her dance is en pointe in a tutu that releases downy white feathers when she flutters. Her facial expressions speak more words than words could. She is magnificent. An invented character called Time is played by another Synetic regular, Ana Tsikurishvili, the daughter of Paata and Irina. A thoroughly captivating dancer clad in harlequin tights and a tutu, she signifies the passage of time and the futility of hours wasted in unrequited love. This delicate enchantress beckons Cyrano to make haste while life passes him by, appearing with fluttering doves in her attempt to end the war. This action play owes much of its lyrical allure to Irina Tsikurishvili’s choreography, especially in the pas de deux with Cyrano and Roxanne, and another with Time and Roxanne, as well as its immersive mood created by Konstantine Lortipanidze who weaves techno-pop with tango. A feast for the eyes and heart. Highly recommended. With Matt R. Stover as Christian; Phillip Fletcher as De Guiche; and Anne Flowers as Priest. Resident Composer & Sound Designer, Konstantine Lortkipanidze; Lighting Designer, Brian S. Allard; Adapter, Nathan Weinberger; Scenic Designer, Phil Charlwood; and Costume Designer, Alison Samantha Johnson. Through March 10th at Synetic Theater, 1800 South Bell Street, Arlington, VA in Crystal City. For tickets and information call 1-866-811-4111 or visit www.synetictheater.org. Warning: This is not your childhood storybook version of Sleepy Hollow. Thanks to Director Paata Tsikurishvili, Washington Irving just got woke. This reimagining foretells a far darker, far cooler, swashbuckling horror story of a headless horseman and his nemesis, Ichabod Crane. Zombie lovers, this one’s for you. Adding to their ever-popular wordless series of dramas, Synetic gives us a wholly different dynamic to ponder. And, hey, it works. You didn’t really expect the Headless Horseman to talk. Did you? Here the HH is presented in a more sympathetic light after he is beheaded by the marauding Ichabod in a bloody battle against Hessian troops. Not only does the HH return to haunt and torment Ichabod, but he messes up Ichy’s romance with the beautiful and feisty Katrina Van Tassel. Suitably ghoulish and intentionally macabre, Ichy finds the HH’s head and, clutching it like a trophy, dances with it. There are hauntings by the ghosts of dead soldiers and a relentless chase to hunt down Ichabod and his cohorts. The darker scenes are lifted by a lavish banquet, comical drinking scenes, and a passionate love scene between Ichabod and Katrina in which he pledges his troth. Acts of war and death seen through Katrina’s eyes become slow motion flashbacks. These vigorous fights are executed with the soldiers moving backwards and it is quite spectacular. There is nothing like murder and mayhem done in slo-mo. Vato Tsikurishvili as Ichabod cuts a most imposing figure. His massive size and glowing bald head belie his graceful abilities in the fight scenes, but even more so in the height he achieves with his leaps, tumbles and lifts, striking a perfect contrast to the delicate Katrina. 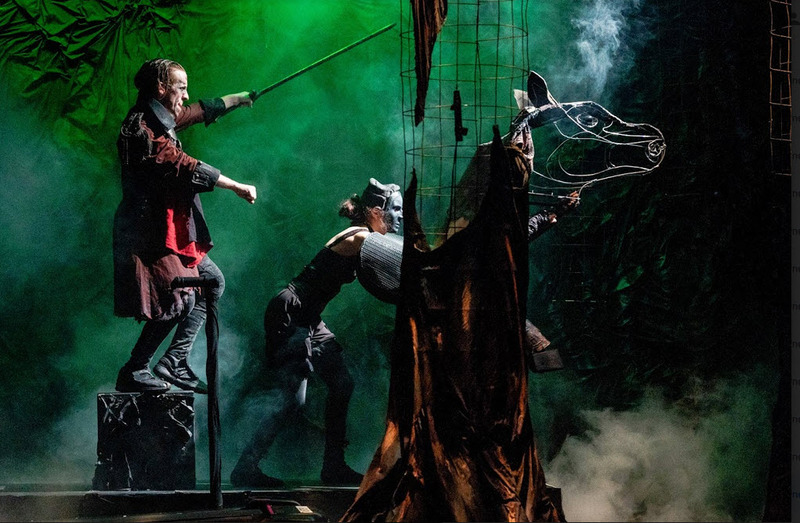 But there is another fantastical creature that commands our attention in this fast-paced, riveting tale and it is the giant metal puppet of the horse portrayed with great expressiveness by Maryam Najafzada and her three puppeteers. To watch her mimic the characteristic movements of a horse, twitching her long tail and pawing the air, is mesmerizing, and adds an important element of charm and vulnerability. Phil Charlwood’s rafters-high, twisted metal ‘trees’ and branch-covered organ provide escape routes for the many chases, while Konstantine Lortkipanidze’s eerie electronica music and spooky sound effects put us in mind that Halloween is just over the horizon. Recommended for ghosts and goblins and those who love them. 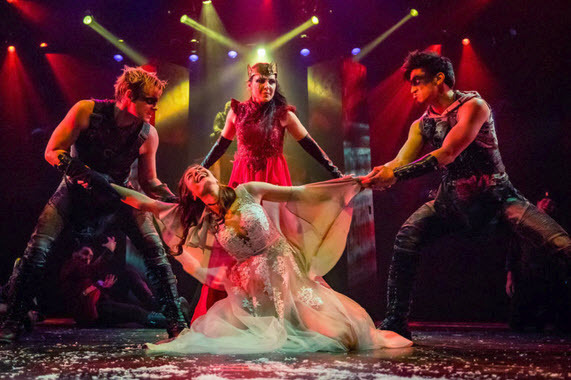 With the beautiful McLean Jesse as Katrina, Scott S. Turner as the Headless Horseman, Justin J. 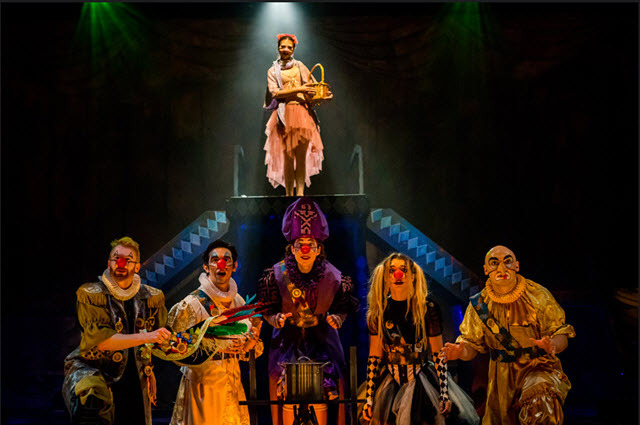 Bell as Brom, Thomas Beheler as Van Tassel/Ensemble, and the Puppeteers/Ensemble cast of Jordan Clark Halsey, Anne Flowers, Megan Khaziran and Matt Stover. Choreography by the inimitable Irina Tsikurishvili, Assistant Direction by Tori Bertocci, costumes by Erik Teague and lighting by Brian S. Allard. Through November 4th at Synetic Theater, 1800 South Bell Street, Arlington, VA in Crystal City. For tickets and information call 1-866-811-4111 or visit www.synetictheater.org. Shakespeare’s first play, Titus Andronicus, was written for pure shock value. It’s considered a revenge play and his purpose was to get noticed and to one up his competition. A sort of revenge of the playwright, if you will. It worked. In today’s world, it would probably be categorized in the fantasy genre along with Game of Thrones. With fourteen murders, six severed limbs and two acts of cannibalism involving meat pies, there’s nothing tame about it. It’s the most gruesome, grotesque Elizabethan potboiler ever conceived for a two-hour play. Never a dull moment. Scott Whalen and Dan Istrate with the ensemble in Titus Andronicus. Photo by Johnny Shryock. 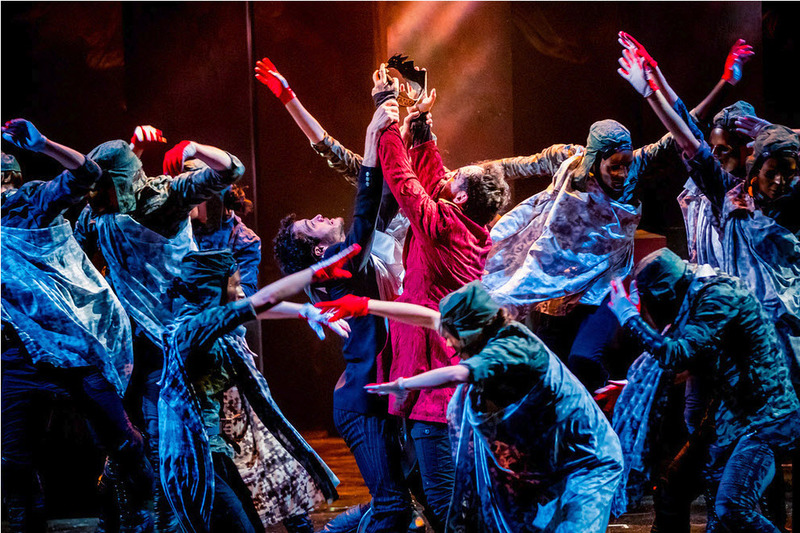 Synetic’s approach is to render the bloodiest scenes, bloodless and Shakespeare’s lines, wordless. It is one of Synetic’s hallmarks. 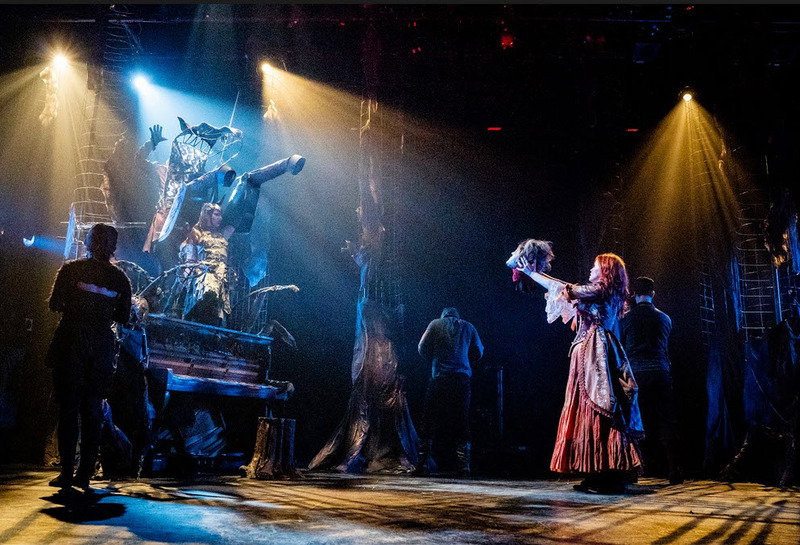 By using reams of red silk, elbow-length red satin gloves and a stage bathed in vivid red spotlights during each murder (I lost count after the tenth), they have achieved all the thrill and all the horror without shedding a single drop of stage blood. The play opens with a horde of Roman soldiers gripping their lances and galloping towards the audience at full tilt. That they’re not actually riding horses is incidental – it’s visceral. In one of the most thrilling productions this year, Artistic Director Paata Tsikurishvili has crafted an edge-of-your-seat interpretation of the classic that will blow your mind. The story of King Titus is drenched in power struggles, betrayal, violence and intrigue. They are all fighting for the crown. It’s a deliciously complex battle of forces between the Goths, here intricately costumed by Erik Teague to reflect modern-day goths replete with metal-studded clothing, and the Romans, whose military toga-like costumes are exquisitely detailed. The women wear diaphanous multi-pleated gowns come hell or high water and the courtiers sport faceless metallic masks. Titus is played magnificently by Philip Fletcher to Irina Tsikurishvili’s Tamora, Queen of the Goths in one of her finest performances to date. The 15-member troupe is spectacular, especially Irina Kavsadze as Lavinia, Tori Bertocci as Marcia Andronicus and Audrey Tchoukoua as Aaron who does a torrid tango with the Queen. Phil Charlwood’s massive rotating sets of monoliths and amorphous castle walls serve well to background the evil of their murderous deeds and the sounds of their clashing swords. It’s impossible to describe the many crimes of passion and struggles for power. Suffice it to say, they are fiercely intense and hyper imaginative with action that explodes at the speed of a super collider housed in an erupting volcano – all set to Konstantine Lortkipanidze’s fantastical sound track ranging from electronica to Gregorian and Phillip Glass to the interior of a wind tunnel. It’s a well-orchestrated madness that can only be described as electrifying from the opening scene to the climax. And though I won’t give away the banquet scene – remember the meat pies? – it’s a stunner set to the flowery notes of carousel music. Insider tip: Black Panther fans look for Titus to give the Wakanda salute. With Chris Galindo as Lucius, Alex Mills as Chiron, Dan Istrate as Saturnius, Matt Stover as Quintus, Dallas Tolentino as Demetrius, Scott Whalen as Bassianus and Scott Turner as Alarbus. Choreography by Irina Tsikurishvili, Sound Design by Thomas Sowers, Fight Choreography by Vato Tsikurishvili and Alex Mills. Through May 27th at Synetic Theater, 1800 South Bell Street, Arlington in Crystal City. For tickets and information call 1 800 494-8497 or visit online. If Director Paata Tsikurishvili hadn’t come out on stage to announce the serious intent of his production of The Trial, I might wonder why he had taken such a divergent approach to Kafka’s dystopian story of one citizen fighting against a totalitarian government. In his introduction of what we are about to witness, Tsikurishvili spells out Franz Kafka’s nonsensical world as, “bizarre and illogical, chaos vs. order, and parallel facts.” This sounds quite relatable under our current administration’s habit of delivering daily tweets filled with “alternative facts”. Josef K (Shu-nan Chu) is an associate VP at a bank. He has been accused of an unspecified crime by a specious government agency and must defend himself to the Committee of Affairs. “The reason for your arrest is kept secret until after the trial,” the Magistrate tells Josef. Enter the insects. 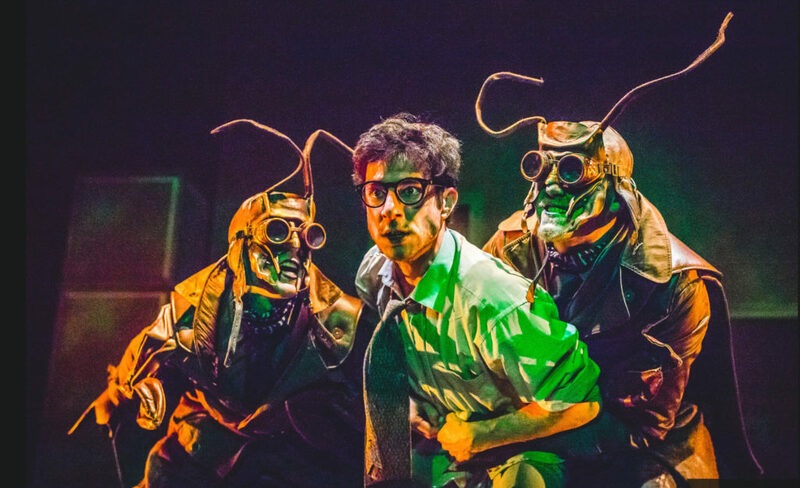 All the characters, save Josef, are bugs – creepy, crawly, undulating, predatory bugs. From Josef’s friend Anna (Tori Bertocci), a sympathetic and sensuous moth and Mrs. Grubach the landlady (Kathy Gordon triples as Clerk and Leni the seductress bug), to Willem (Chris Willumsen), Josef’s Uncle Karl (Lee Liebeskind), Franz (Thomas Beheler) and Huld the lawyer (Ryan Tumulty who also plays Inspector/Judge/Priest). These bugs range from cockroaches to the unidentifiable, though I think I noted a shield bug and a caterpillar. In this convoluted interpretation of Kafka’s nightmare, the government has gone buggy. Sorting out the imaginary legitimacy of the kangaroo court is fun – for a while. 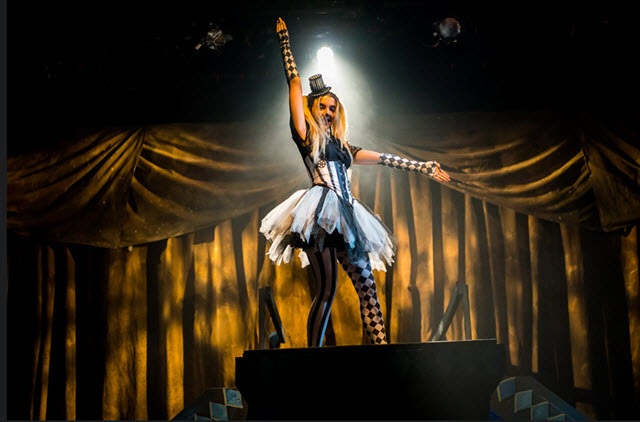 But eventually, the action devolves into a dark children’s play, an ersatz version of Alice in Wonderland, as opposed to, well, a serious political drama. 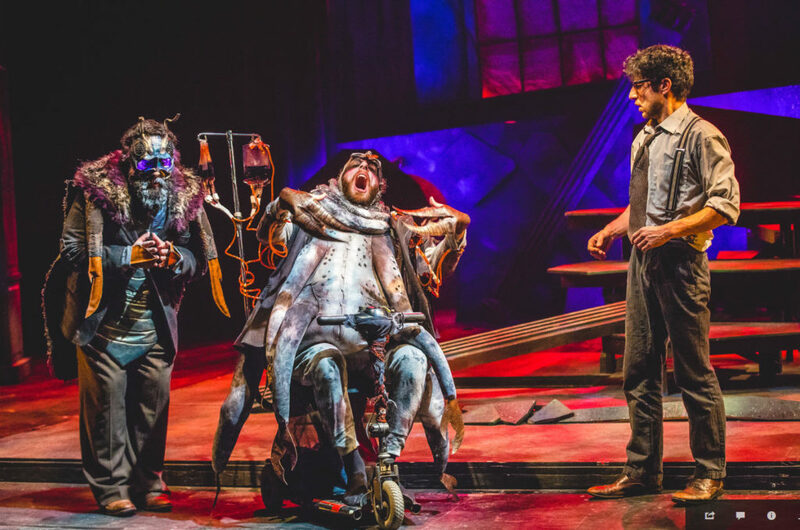 Huld, in a motorized chair outfitted with blood-filled IVs, proves more comical than ominous and even the disembodied voices and accompanying electronika don’t provoke a wince. 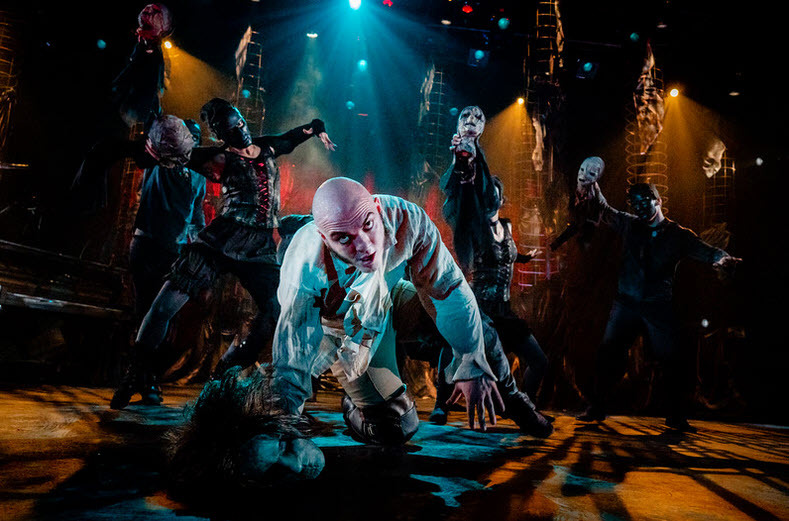 This is not the caliber of production usually seen from Synetic, a contemporary physical theater company whose work is most notable for their brilliant “Silent Shakespeare” series and other highly creative complex productions. Costumes by Erik Teague do help set the scene. They include cleverly inventive interpretations of thoraxes, antennae, leather wings, massive metal pincers and glow-in-the-dark compound eyes designed for maximum spooky impact. Ultimately, the only real terror is in the prophetic tale. As the gatekeeper tells Josef, desperate to understand how this inequity has befallen him, “The law is not accessible to all.” How well we know. Through February 18th at Synetic Theater, 1800 South Bell Street, Arlington in Crystal City. For tickets and information call 1 800 494-8497 or visit www.synetictheater.org. 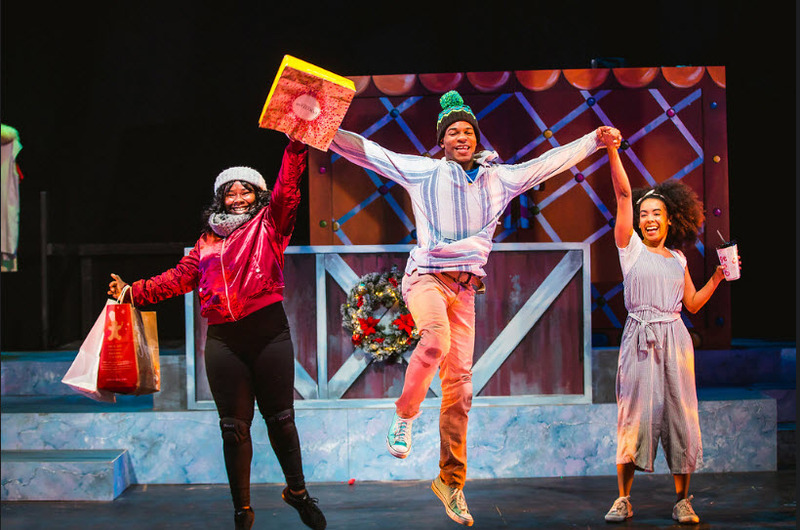 Hansel and Gretel at Synetic Theater – During the bustle of holiday crowds, Gretel tries to keep her brother, Hansel, out of trouble while their babysitter leaves Gretel to fend for them both. As Hansel embarks on his own wonder-filled exploration of his everyday surroundings, he and his sister fall into a magical realm that takes them far away from home. 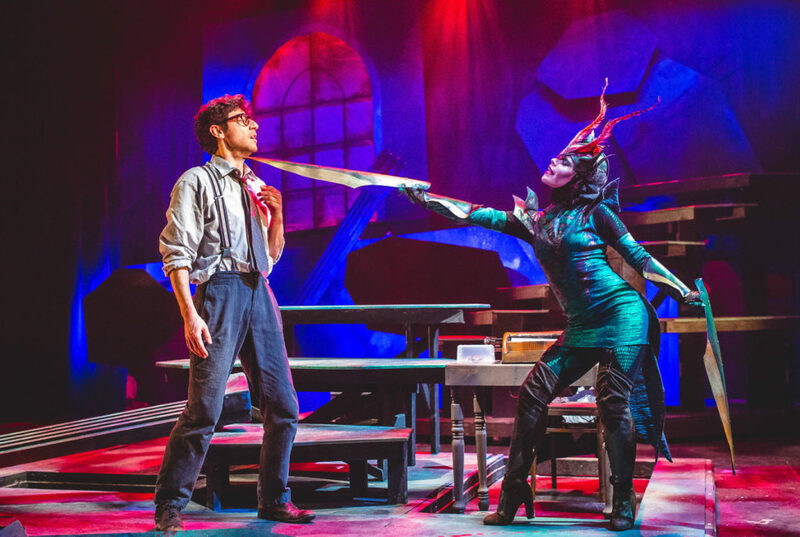 In this wordless production, the well-beloved Grimm fairy tale embraces the fantastical through the eyes of those who see the world through a different lens. Directed and choreographed by Elena Velasco and Tori Bertocci. Through December 23rd at 1800 South Bell Street, Arlington in Crystal City. For tickets visit www.synetictheater.org. The Old Bull & Bush at MetroStage – Originally staged in the Old Vat Room at Arena Stage writer, director, and actor Catherine Flye will be transferring her 9-person troupe to a circa 1912 replica of the famed Hampstead, England pub to jolly up your holidays with food, 35 songs, jokes, dance, a sing-along and an abbreviated reenactment of Dickens’ Christmas Carol. 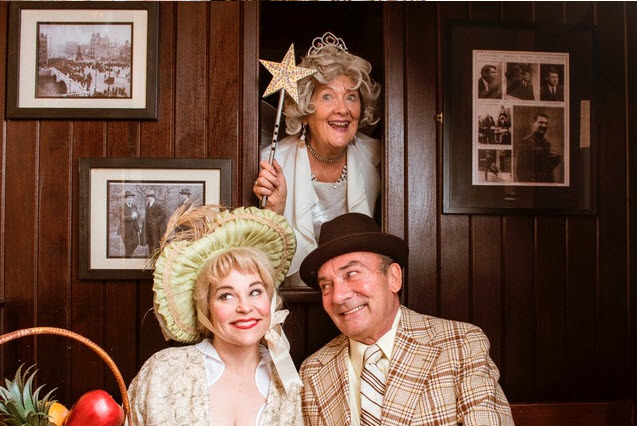 With Christmas crackers, British beers and sausage rolls for purchase, the classic British music hall entertainment runs through December 24th at 1201 North Royal Street, Alexandria, 22314. For tickets visit www.metrostage.org. 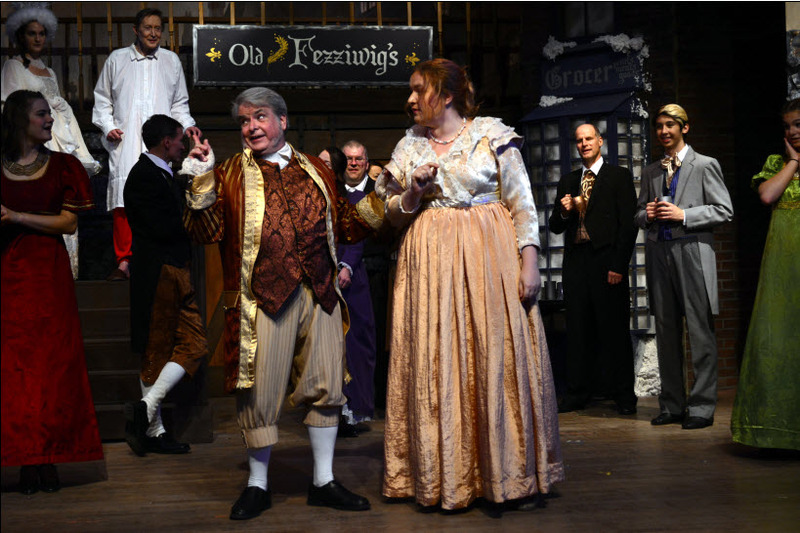 A Christmas Carol at The Little Theatre of Alexandria – In a fresh interpretation by director Eleanor Tapscott, enjoy a return of the Christmas classic by Charles Dickens. Ebenezer Scrooge, a miserable Victorian humbug, travels with diaphanous ghostly guides (beautifully choreographed by Ukranian Victoria Blum) through Christmas past, present, and future to find the true meaning of the holidays. Complete with special effects, Victorian carols and Tiny Tim. Through December 16th at 600 Wolfe Street. For tickets call 703.683.0496 or visit www.thelittletheatre.com. Rudolph the Red-Nosed Reindeer at “ICE!” at the Gaylord National Resort & Conference Center – A 9-degree winter wonderland carved from over two million pounds of ice, a Christmas Village, merry-go-round, Glacier Glide ice skating rink, “JOY” – an eye-popping, Broadway-style holiday musical show, nightly snowfalls and dancing fountains at this first-class holiday destination. Additional events are a Mistletoe Mixology class, Build-A Bear Workshop, photos with Santa, Cookies with Mrs. Claus and so much more. Through January 1st at 201 Waterfront Street, National Harbor, MD 20745. 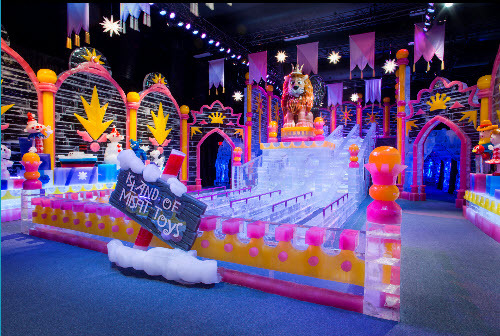 For tickets and event times visit www.GaylordNationaltickets.com. 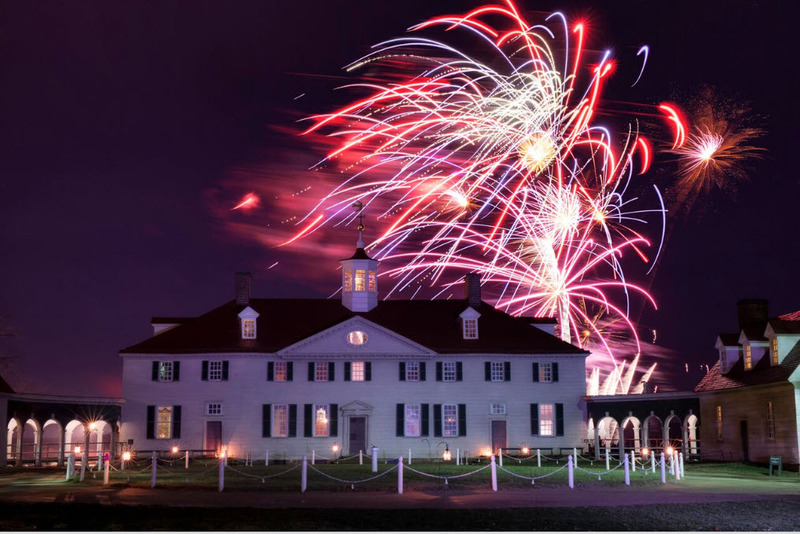 Christmas at Mount Vernon – Tour George and Martha Washington’s mansion by candlelight and make merry with 18th century dancing, fireside refreshments and caroling. Meet Aladdin the Camel, watch holiday fireworks on December 15th and 16th, hear period music, experience a military encampment and more. For tickets and event times visit www.MountVernon.org. Holiday Follies at Signature Theatre – Starring jazz singer Ines Nassara, David Rowen (Signature’s Diner) and Katie Mariko Murray (Signature’s West Side Story) singing classic holiday songs. Through December 16th at Signature Theatre, 4200 Campbell Avenue, Arlington, VA 22206. For tickets visit www.SigTheatre.org. 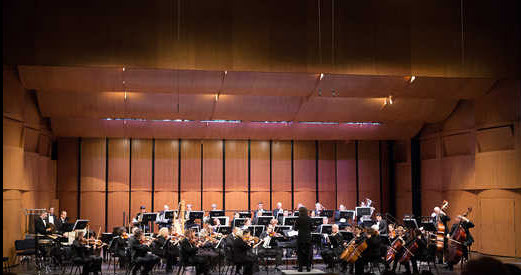 The Symphony Orchestra of Northern Virginia in collaboration with the Office of the Arts presents a “Friday Evening Chamber Concert Series”. The next concert “A Brass Christmas” is scheduled for Friday, December 15th at the Durant Arts Center, 1605 Cameron St. For online tickets visit http://bit.ly/2vSKXRd. Tickets are also available at the door.